Known to be a true feast for the eyes, the Skygarden chandelier, designed by Marcel Wanders, is so refined that you risk getting lost in its dazzling universe. Its aluminum dome – offered in several shades, including matt rust, matt gold, glossy white and glossy black – camouflages a sumptuous décor of white plaster bedecked by festoons and flower garlands. There is an appealing harmony between the chandelier’s simplistic structure and its neo-baroque ornaments. The emitted light is diffuse and sustained, without being overwhelming. Your guests will surely appreciate the perfect ambience created by a Skygarden chandelier placed above the dining-room table. 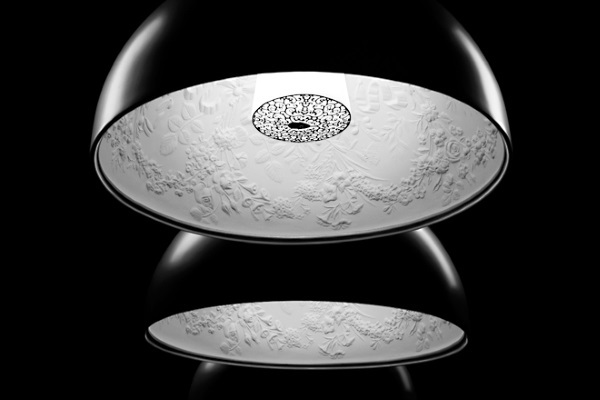 To design such a beautiful item, Marcel Wanders found inspiration in the friezes that bedecked the ceilings of his childhood home. He was often struck by the surprising shimmering of the light.